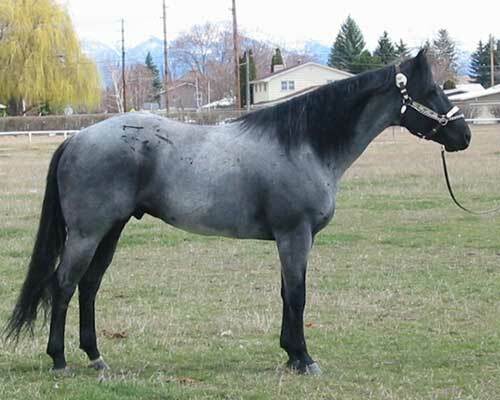 Hancocks Blue Olena is a 1999 blue roan out of Merry Boy Hancock and Olena Dolly. He is double-bred Hancock and a great-grandson of Doc O'Lena, so he has plenty of "cow" in his pedigree. We purchased "Blue" as a yearling in hopes that he'd shape up into a good stud prospect. As of 2007, we haven't been disappointed. Blue is well-muscled with strong shoulders and hind quarters. He's a powerhouse with a lot of energy, drive, intelligence and a taste for cow. Blue had his early training locally, and competed in sorting and penning. 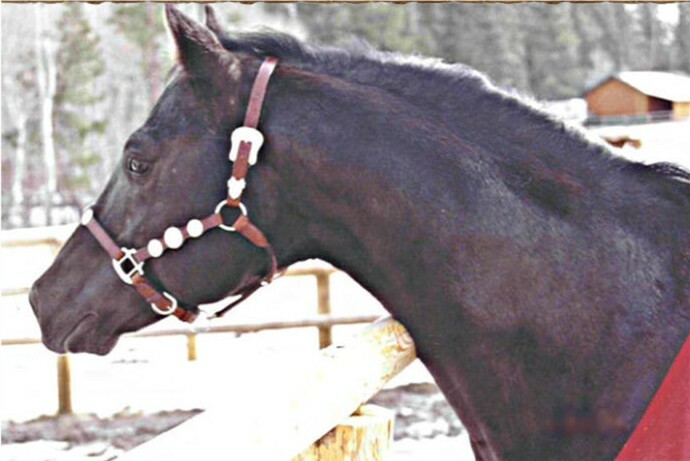 Blue has been bred to a variety of mares and has consistently produced offspring with nice hips, pretty heads, straight legs, and willing dispositions. We're liking what he sires, and his color percentages are very high. 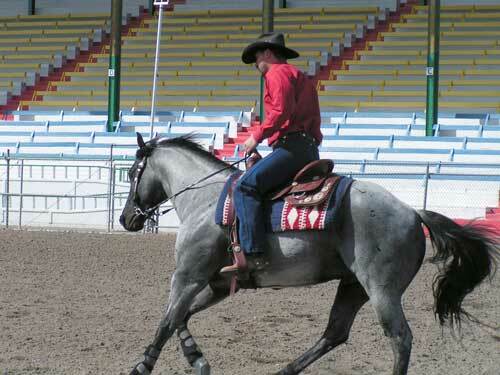 Blue sires a high percentage of blue roans and black foals when bred to black mares. His color percentages drop a little when bred to red mares. Blue has been bred to several of our Freckles Candoo daughters and we've been delighted with the results of this line of breeding. We're certain Blue has a bright future as a competitor, ranch horse, and stud. Blue stands at Chief Cliff Quarter Horses in Elmo, Montana. 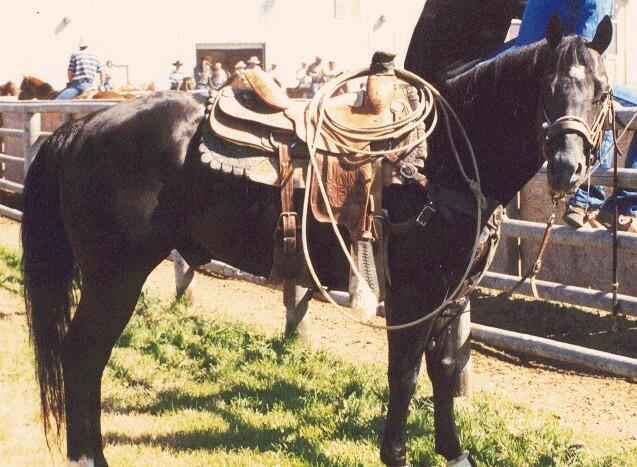 Up until June 2006, we stood Freckles Candoo, our much beloved black foundation bred stallion. Freckles had a wonderful temperament, was intelligent and well-mannered, had a beautiful head, compact build, and plenty of cowy instincts. He bred all variety of mares and sired all colors of foals, and every one has had a good mind, has liked people, and has taken to training readily. He died unexpectedly at 19 years of age. In October 2001 we bought Freckles Candoo from Mack Capers of Victor, Montana. We used this stallion since beginning our operation and were delighted when he came up for sale. Not only did we have the opportunity to own our favorite stud, we also incorporated several of his daughters in our broodmare band, and they're working out fabulously. What we liked most about Freckles was his solid build, medium size, pretty head, and winning attitude. Freckles consistently turned out good-looking foals with nice heads, big hips, intelligence and quiet disposition. He's sired palominos, duns, blacks, browns and bays, and when bred to colored APHA mares turned out a high percentage of color. In this part of Montana, and down in the Bitterroot, Freckles offspring have been popular and sought after. Freckles Candoo was a grandson of Colonel Freckles and had 7 generations of King Ranch breeding behind him. He was an exceptional horse, and a superb stud. We won't find another like him.